​Half the time we are on constant lookout for a product that will give us baby-like skin. We end up throwing away a shaving cream as soon as we bought it because something in it didn’t sit well with us. As our preferences are varied, they somehow converge in regards to finding the best cream that is soothing, thoroughly cleans and takes less time to use. Being a soap person isn’t that bad, neither is it bad to try out Cremo Shaving Cream . It is everything you’re looking for wrapped into one. So, what exactly is Cremo Original Shaving Cream? ​With all the Scents and flavors that come with shaving creams, Original Cremo Shaving Cream comes with a sweet scent. It has an overwhelming smell of citrus. The scent is strong and welcoming to the lovers of orange aromas. Sadly, as one man's meat is another one's poison, the scent might be disturbing to some, especially those who are sensitive to strong scents. Cremo Original Shaving Cream is the best product one could have. One needs only a small amount of it and warm water before application. The 6oz tube it comes with is guaranteed to last ages as a result. It has a smooth performance, and after application to the desired area, the blade slides beautifully without friction or irritation. It offers no cuts or razor burns. However, for amazing results, one needs to do multiple blade movements. Among the ingredients of the cream is a moisturizer. The other ingredients might sound a lot chemically than what you would know. This shouldn't put you off as the cream does what it says it does. However, some people react to many chemicals included in a product. The result may be a dry skin contrary to what it is supposed to do. Another thing to note is that after shaving, you should wash thoroughly with lots of water as it tends to get sticky. The size of the tube holding Cremo Original Shaving Cream is exactly 6 ounces and is highly cost-effective. The instructions it comes with are specific about the scale of a drop you should use. It says that only an almond size dollop should do the trick. With this small drop, you can pass it on the shaving area after applying or wetting with warm water. The life of the cream depends on the number of drops and the number of times you need to pass it to shave. Some users have, however, refuted the almond size dollop claim. They say you might need more than that if you want to cut and avoid clogging of the blades effectively. But all in all, this cream container can go for as long as two months or more of daily shaving. Perhaps the longevity is also aided by the cream lacking lather, which is a disadvantage anyway. ​Many times when we are buying a product we want to look at the cost first. When it is too high, we do some scrutiny on its effectiveness and performance. If we find out that product doesn't do what is proclaimed to do, we drop it. Cremo Original Shaving Cream, however, does not disappoint. It is worth your money if you consider its performance and durability. Often sold as a pair with Cremo Cool Shaving Cream, for a reasonable price, it is the best deal ever. After purchase, you are supplied with the 6-ounce tube of cream for 90 days! ​The answer is simple; it is a different shaving cream that is Air free and no lather. It works by applying warm water on your face or the area you want to shave, rubbing an almond size dollop on it severally. Although it is not the best lubricant, it gets concentrated in your skin quickly to allow smooth gliding of the blade or the razor if you are into traditional shaving. ​The Cremo Original Shaving is impossibly slick. The water molecules it comes with become easily activated and reduces nicks, irritation and razor burn when one is or has shaved. In a cremo shaving cream review, it ii considered the best regarding comfortability. It leaves your skin highly nourished, and smooth ended like a baby's face! Have I mentioned that it is the longest lasting shaving solution anyone could ever have? It is that product you can have and invest on and enjoy for life; with its 90 day supply of the cream, it is worth a try. 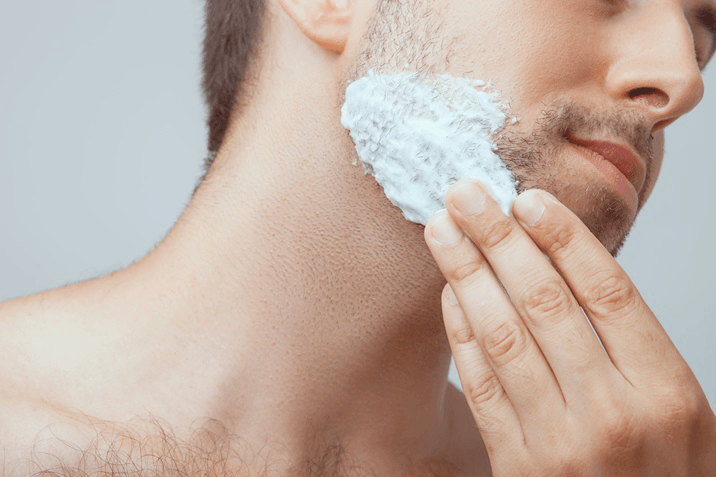 ​Where most gels, other shaving creams, and ﻿﻿typical shaves, removed Original Shaving Cream only requires an astonishingly thin foam free layer to work its magic. It doesn't even necessarily touch your skin as it is activated by the warm water you've already applied. It gets concentrated in your skin without producing foam, or clouds to the scraped while shaving. It comes packed with powerful conditioners that nourish and protects your skin. Most of the other options use fluffy foams and have lots of air. They are not the best lubricants. With Cremo Cream, you are assured of the best results. Why buy it? If you are looking for an easy cream that allows natural shaving regardless of whether you are using a blade or a razor, this is the best product for you. People love the lubrication that comes with the Nivea Men Sensitive Shaving Gel. This is because it is versatile and doesn’t limit itself to specific skin types. It is the best for people with sensitive skin types and like Cremo Original Shaving Cream, it leaves one comfortable without burn or nicks. It has also been formulated to improve one’s health. Performance-wise, both Cremo Original Shaving Cream and the Nivea Men Sensitive Shaving Gel have the best effectiveness. For those who would rather use gel instead of cream or foam for shaving, the soothing feeling of this gel is something worth trying. On the other hand, if cream is your option, the equivalent is Cremo cream. Nivea comes with extracts like chamomile and Vitamin E while the latter has a combination of many natural extracts making it the best between the two regarding skin health. Both the gel and the cream are nice lubricants. 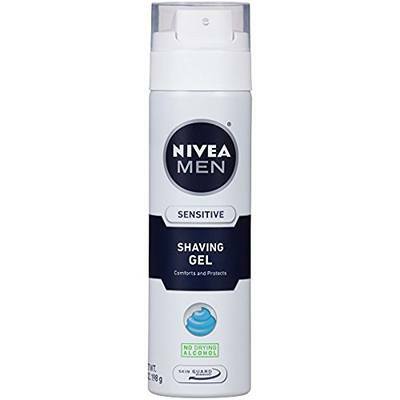 Nivea Shaving Gel is thick and ensures a close shave without irritation just like Cremo Cream. Again, they are both the best considering skin sensitivity. They do not allow one’s skin to dry or develop rashes. Comparing their prices, they are almost the same though Cremo Shaving Cream often comes with the Cool Cream or a moisturizer at a price. The two are worth your money. The 90 day supply of cream for Cremo makes it our favourite. Furthermore, the gel will run out faster than the cream if you looked at the amount to be used. The cream can go for months. As mouthful as it sounds, this cream gives Cremo Shaving Cream a run for its money. It is the best all natural shaving cream and people love that about it. It is a hundred percent natural and chemical free, thick, moisturizing and soothing. It is also the best for people with sensitive skin. Where the Cremo Shaving Cream comes with a citrus orange aroma, Kiss My Face all natural cream comes free of the artificial fragrances, chemicals or parabens. If you are looking for a cream that is all natural, Kiss My Face Shaving Cream is for you. Cremo Shaving cream on the other hand, although contains a significant number of natural extracts, it is still not one hundred percent natural. Kiss My Face cream is biodegradable and comes in a recyclable container. It has no preservatives and is gluten-free. On one hand, both Cremo Shaving Cream and Kiss My Face Shaving Cream contains ingredients that are friendly to the skin. The two creams however, are slightly different considering what extracts they contain. Kids My Face has green tea for antioxidants, coconut oil and Vitamin C.
Extracts of lemon, olive and Aloe Vera are present in the two. Both are as effective for moisturization. 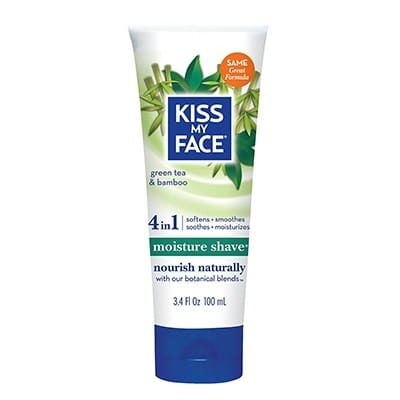 Nice and thick, Kiss My Face cream is consistent and it feels like gel without its artificial texture. It makes it ideal for both gender as it doesn’t wash off. Comparing the prices of the two, Kiss My Face Shaving Cream is almost three times less than the Cremo Cream! It is, however, disadvantaged in the quantity sector. You don’t get a lot of it. If you are looking for a cream free of aromas, it is the best for you. Otherwise, Cremo is its close competitor. Well, what is there not to like about this product? It produces a thick lather, which has a smooth feel and gives a meditation-like sensation as the blades glides across the skin. It is also scented and unlike the citrus smell of Cremo, it has a sandalwood scent. It is versatile and doesn’t choose blades or razors. 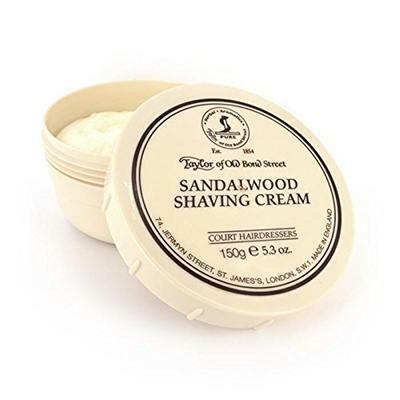 Using Taylor of Old Bond Street Sandalwood Shaving Cream leaves you with a manly scent with a closer shave unlike any other. You don’t even have to put on cologne! Oh yes, it is that strong. It is woody with a blend of Cedar and Sandalwood. Lavender and Rosemary add subtle floraly. It also has a Jasmine and a Rose scent. Sweet. Interestingly, the shaving cream is one of a kind and has covered all the areas we usually look at; the price, ease of use, smoothness, among other things we consider. It leaves your skin soft and smooth as Cremo Shaving Cream will. If you are looking for thick lather cream with richness and close shave, this product is for you. To make it easy for you to apply the cream on your face, purchasing the product includes a free mixing bowl, which will enhance ease and foam with the use of a brush, which is proprietary. The setting itself presents a vintage and old-fashioned shave. It presents an experience worth remembering all the time you smell sandalwood. Its ingredients, like Cremo Shaving Cream, work magic in softening your skin and hair making the shaving experience easier. However not as wet or moist as other creams or gels, it presents easy shaving for anyone looking for an incredible close shave. The price is the same as the Cremo Shaving Cream. Regrettably, this is a product to envy as opposed to cremo cream. Although, if you do not want to use a brush and certainly don’t like lather, the latter is the product for you. ​Cremo Original Shaving Cream packs lots of admirable features one would want in a shaving cream. It is affordable, smothering and leaves your skin nourished and healthy. It is durable unlike any other on the market. If used correctly, it delivers the best results and will last long. Despite the few disadvantages it comes with, they are a trade off considering the benefits it packs. Give it a go-ahead and say so-long to nicks, razor burns and irritations while shaving.